this style fetal demise pouch is unisex if baby was not yet determined if it was a boy or girl we also sell this size in pink or blue too.Warm hat ,comfortable pouch and a micro sized teddy to keep baby company lovingly forever. 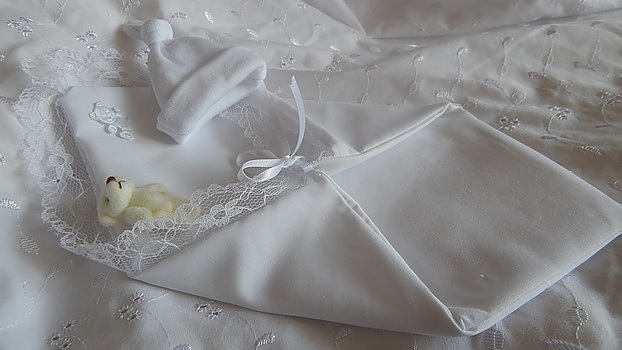 your baby can feel warm settled for a final sleep in this snug micro sized fetal demise pouch.a beautiful hand made burial pocket for your little angel. 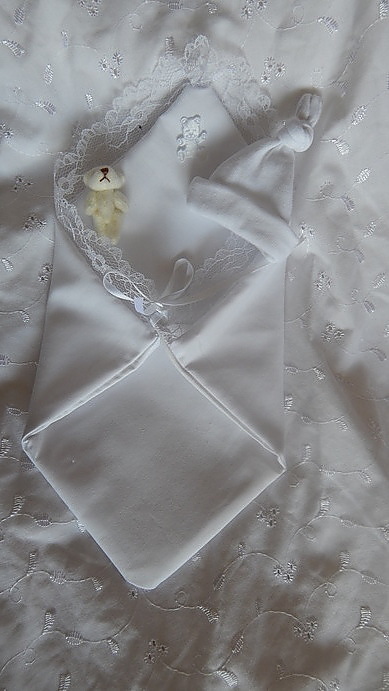 comes complete as a 3 piece set with matching knotted hat and tiny teddy bear. Some families like to order two to keep an extra one in baby's memory box for treasured memories.click the order button just below to order this size for baby born 16 weeks 0r 17 weeks.